April 18th, 2011 01:04 AM | by William Bell | Eschatology. Hello, it’s William Bell, president of AllThingsFulfilled.Com. “Thank you for visiting my site. If it’s your first time, you’ll find tons of free articles, videos audios and charts to help you in your end times studies. If you are a regular visitor, I hope that the reason you’re here and return is because you continue to find value in the messages we share. 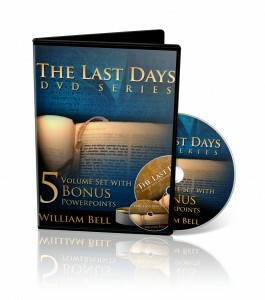 I’d like to give you ten reasons why you should place your order today for The Last Days DVD Bible Study Series. 1. This is a very unique study held in a home setting with a Lutheran Bible group who invited me to teach each Friday for 5 consecutive weeks. We video-taped the entire study with each lesson lasting about one hour per night. You have the opportunity to experience as they experienced these studies as we journey in a study of the last days beginning in Genesis 49. 2. Each study while complete within itself, builds upon the other. So that as we progress through the study, you gain a better picture of how it all fits together. Your horizons broaden as your depth of knowledge increases. 3. You get to hear some of the questions which were asked during the meeting so that you learn from their perspective what issues were coming up for them. Listening to questions asked by others is an excellent way for you to increase your grasp of the material. 4. We presented the information with PowerPoint slides that give you the opportunity to both hear and see exactly what’s being covered so you don’t have to rely on trying to remember everything at once. To ensure that you don’t miss any important information, we’ve included a separate Data CD that has all 5 lessons on PowerPoint. You can simply load this on your computer and watch on the screen as you view the DVDs or you can print them out and make notes along the way. 5. In addition to using these PowerPoint slides for your notes, you can use these to share this message with your friends. It’s a great way to introduce them to the subject without experiencing the resistance that often occurs when you’re sharing the message face to face. 6. We’ve captured a little bit of history here in the ongoing reformation of true bible prophecy fulfillment studies. So, you’ll own something that’s very valuable in the future. This may not seem that important today but in years to come to have actual DVD recordings of those who helped to shape this movement will become rare as more people become aware of this great work. 7. You could share these DVD’s in your own Bible study or with your church. Use them to learn and then go out and conduct your own studies. 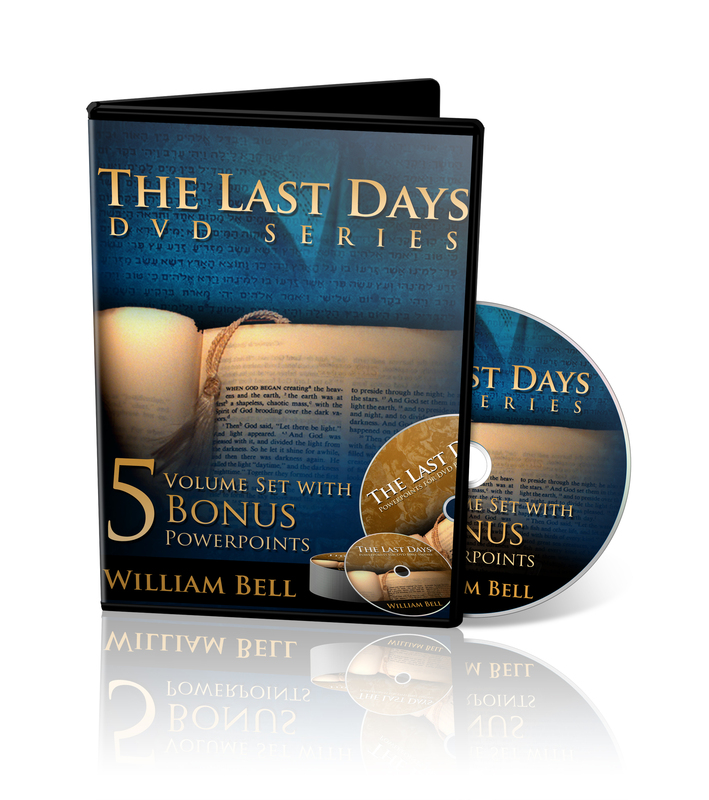 The Last Days DVD’s will give you insights to create your own studies. 8. You will be helping us to create better and more valuable studies in the future. It’s a small way you could say thank you for the all of the content we supply on our blog to help you in your studies. 9. The DVD’s are very reasonably priced at only $44.97 plus shipping. You get all 5 DVD’s, 5 PowerPoint Lesson Guides and in addition we’ve added a Bonus audio CD of “Israel and the Land” which is a presentation recently delivered to a live audience. Individually priced, this entire packed would cost $62.00 plus shipping, You’re saving $17.00, plus multiple shipping costs if ordered individually. 10. You have a full one year guarantee against defects. If for any reason your shipment is defective for a period of one full year, we’ll replace it absolutely free of charge, and we’ll pay the postage so, it’s completely hassle-free. I hope this information helps you to make your decision about purchasing your Last Days DVD Study Series. I know that you will be blessed and enlightened by this study. 2. This will take you to the order page where you’ll be allowed to enter your credit card information. You will also have the option to pay by PayPal if you choose. Your transaction is secure. Just look in the left-had corner of the address browser bar for “https:…” the “s” let’s you know that you are ordering over a secure server. If you are ordering through PayPal they are one of the most trusted and safe online payment systems in used worldwide. 3. Enter your information, in each line of the order form, beginning with first, last name and phone, etc, until you’ve completed the form. 4. Check your form for accuracy, then press the green “Submit Order” button in the lower right corner of the page. Be sure to let us know how you heard about us and also include any special delivery information in the two boxes at the bottom of the page. 5. Once you’ve completed your order, you can print your order confirmation page. You’ll also receive an electronic copy of your order form through email. Once we receive it we will promptly process your order within two business days of receiving your electronically deposited funds. 6. Your shipment should arrive within 7-10 business days, but usually arrives sooner. International orders please send an email to info@allthingsfulfilled.com for rates. 7. Finally, if you have any questions with the ordering process, you may send an email to: info@allthingsfulfilled.com.